People watching Isobel Knowles and Van Sowerwine's Out in the Open. Photo by Bryony Jackson. The rain belted down on the markets throughout the fifth day of Biennial Lab, but that didn’t stop people from weathering the storm. Today it seemed as though the art projects were properly embedded in the market, as though they were settling in nicely. Of course, they’ll be gone in three days, and it makes us wonder whether the traders with which the artists have engaged will miss them when they’re gone. But the Biennial Lab process seems as though it’s built and strengthened the bond that artists and visitors have with not only the site, but the myriads of contexts within the markets themselves. The artists will continue these relationships, no doubt. And Biennial Lab isn’t just about physical site, but the people that inhabit it. It’s about those relationships, and as much about the agreements as it is about the disjunctures. Sitting in the Biennial Lab hub, we were visited by an array of people, including the well-known Australian comedian, Chris Lilley. The Hub itself had, just like Hiromi Tango’s sculpture outside, evolved during the week, with raincoats appearing on the counter in a gesture of response. 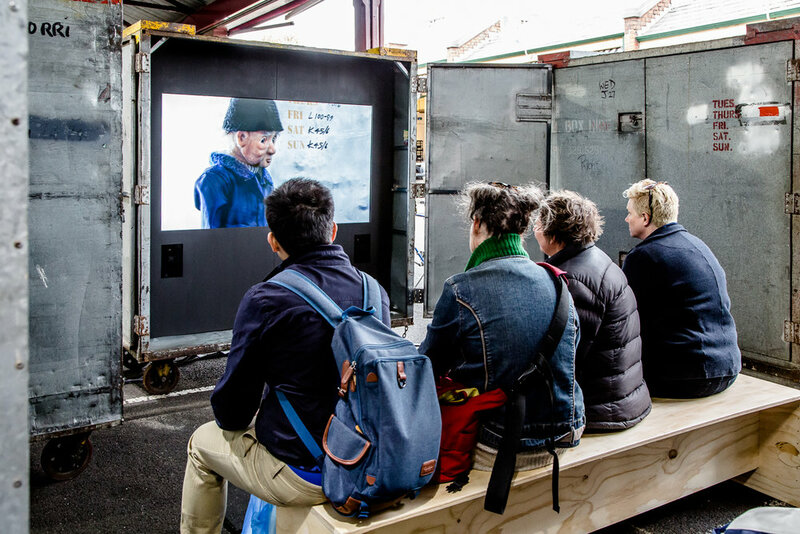 It was a great day to sit in the protective unit of Isobel Knowles and Van Sowerwine’s Out in the Open, where the metal storage boxes synonymous with the Queen Victoria Market were emitting the sounds of a heartbeat. The boxes encased the film that was almost as moody as the weather. The Mechanics Institute's patch sitting on their counter as part of Trade School. Photo by Bryony Jackson. The Mechanics Institute today ran workshops at their Trade School, with Tao Wells, who presented Unemployed New Zealander on Welfare in Melbourne, with $500 Arts Grant and Melbourne-based blogger and all-round agitator, Natalie Thomas, who spoke on the potential for exploitation in the art field. In the context of the market, it was good to see a reflexive examination of how art can be used by not only the financial or cultural markets, but in the field of human interaction and the worth of art in that context. We listened to Field Theory late into the night, where for a three-hour block, Mish and S-Ro had Melbourne-based artists Amy Spiers and Catherine Ryan in on the show. Discussion meandered through socially engaged art practice, performing activism, activism itself, and how effective time-based or endurance pieces can be. It was great to hear a reflexive discussion on what Field Theory are doing (essentially an endurance piece, but within a deeply strange situational context where the market changes by the hour). While they were speaking about social engagement and arts role in the civic, a drunk man rolled past their structure, swearing and acting a little aggressively, and everyone present in the studio acknowledged that there’s that tension in what’s presented as social engagement in art, and what happens when artists are confronted by social situations that aren’t quite welcome when performing these engaged works.